Full board during trek and tour. Camping while on trek. 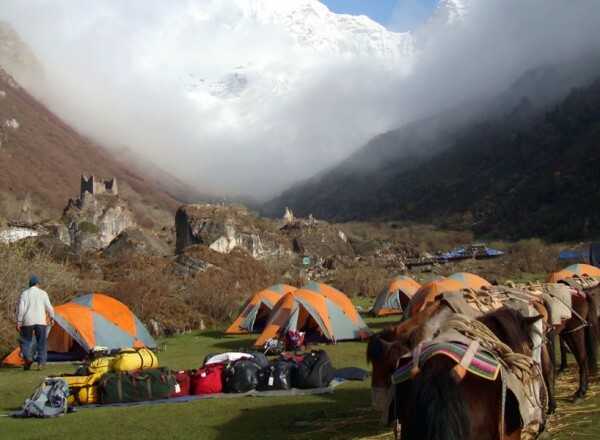 Chomolhari trek isoff-the-beaten path, high altitude trekking but not very long. We also have chance to see the Tiger Monastery and the sites of Paro and the capital, Thimphu.Sadly modern life has encroached on this route to some degree, with an electricity supply following the trail up the Paro Valley. 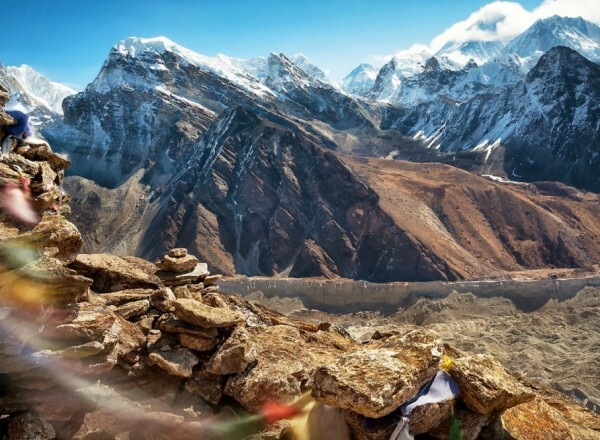 However, look beyond the wires and you will be treated to amazing scenery that ranges from the picturesque valleys of Paro and Thimphu, to the incredible mountain vistas of Chomolhari (7314m), Jichu Drake (6794m) and Tshrim Khang. Throughout the trek you will be weaving your way through Rhododendron forests and over glacial streams. Open arrival at Airport, we will received by our representative and transfer to Thimphu. Overnight at the hotel in Thimphu. First day of the trek follows Paro Chhu valley climbing up the ridges. The actual trek starts from Drukgyel Dzong at 2580 m. From here you look back to see how dzong was positioned. After covering short distance you will find settlement of Chang Zampa. A further walk takes to settlement of Mitshi Zampa finding little shops and hotels.The valley widen and you will reach at army post of Gunyitsawa at 2810 m, there are also primary schools and shops. 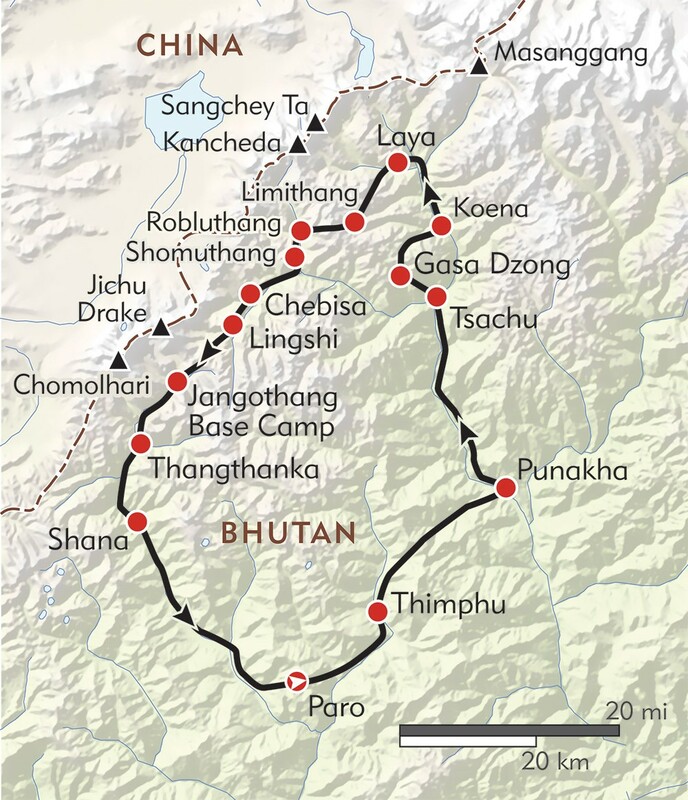 The trek continuous at side of Pa chhu through conifers and rhododandron coming across Jigme Dorji Wangchuk National Park. By making gentle climb on the rock through oak, crossing several steams come across Phari Dzong of Tibet. Then climb little ridge, cross the Paro Chhu on a wooden bridge. Finally come across Thangthangka at 3630 m, where Bhutanese style house are there. At night Jumolhariis covered with cloud, but be sure to view early in the morning. Jumolhariappears behind the a ridge. Less than an hour from camp at 3730 m is army post. A short climb leads to small chorten finding yak country. Making further climb come across Takethang, clustered of stone houses on plateau at 3940 m.
Here is best viewpoint, you won’t get better any better than here. The ridge is endless, after an hour of climb you can view Jichu drake (6989 m) and Jumolhari. If you like to see much of the country better to trek Nyile La to Lingzhi. If you have problem with altitude don’t go to Lingshi. Ten minutes after beyond the camp, finds settlements. This is the last settlements in the valley and is extremely isolated places. From this place you can also view Jichu Drake. Passing by you can see Jumolharipeak. Then it comes across Nyile La at 4890 m. Dropping down to the valley at 4450 m and stop for lunch here. 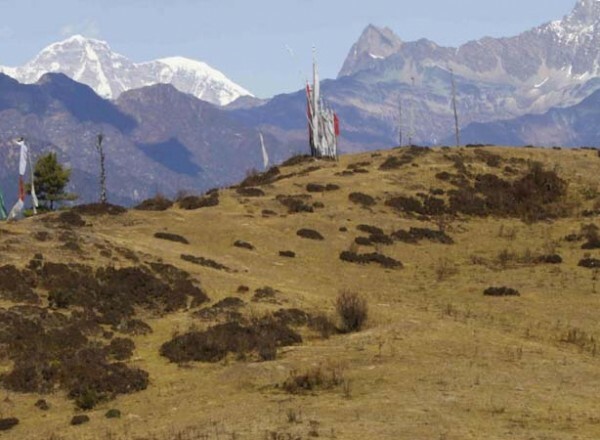 Trekking further see army camp, where Jumolharipeak is visible. At last coming to Lingzhi. 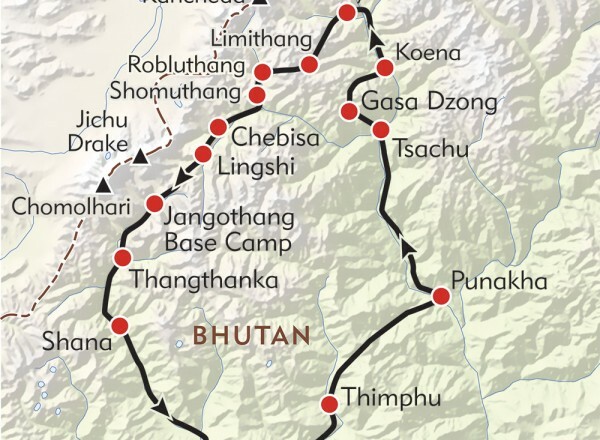 The Laya Gasa route leaves the Jumolhari and climbs opposite the camp towards dzong through white chorten. It climbs steeply to Yeli La (4820 m). 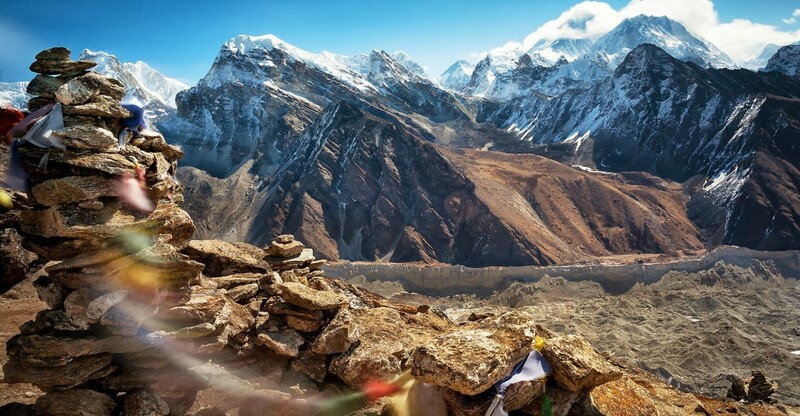 From this pass on the clear day, you can view Jumolhari, Gangchhenta, Tserim Kang and Masang Gang. Further downstream come across Shodu at 4110 m.
The route cross the river 6 times on bridge built of huge logs. Within one hour climb come to Barshong; in Barshong you find small ruin Dzong. 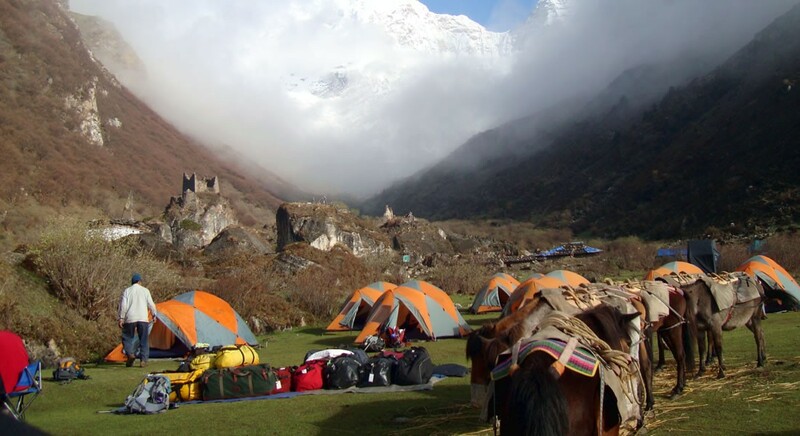 The camp in below the ruin dzong at 3680 m.
The trail goes in and out through conifers and high broadleaf species to pass at 3510 m. The trail drop down and reach to road head at Dodina at 2600 m.
We will drive to Paro airport for the flight of next destination.